Having problems tagging an early season buck? These proven tactics can make the difference. As the formula dictates, the first step in filling early season tags is finding the food and water. During the season’s early stages, testosterone levels are low and breeding isn’t a factor. Food, water and safety are bucks’ primary motivators. That’s common knowledge amongst hunters. What many seem to have difficulty with is pinpointing mature bucks’ preferred food and water sources. One must understand that each potential food source is desired relative to its growth state, surrounding habitat and competing options. For example, soybeans are highly desired in their green state. Deer devour the tops, leaves and even the green pods. However, once they brown they drop in desirability. When that occurs, deer shift a significant portion of their feeding to other options. Eventually, these options run out or mature past their ideal state. In turn, soybeans climb back up the desirability ladder, but not because they have become better. The beans have remained constant—the other options have simply disappeared or spoiled. With every natural food source experiencing the desirability cycle, hunters must be conscious of this when selecting food sources to cover opening day. Just because Mr. Big was hitting the beans in late summer doesn’t mean he’ll be there when season begins. The same applies to last rut’s hot crops. Food sources are in a dynamic state of flux. 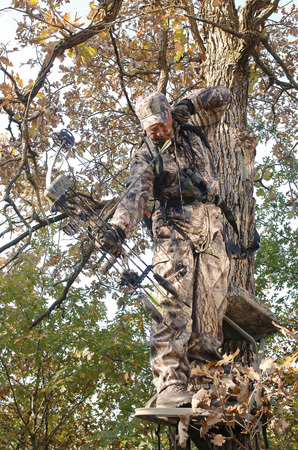 The hunter’s job is determining which is atop the ladder to begin the season. Furthermore, the food source location must provide the illusion of safety. Unlike does and young bucks, mature bucks commonly sacrifice top-rung food sources for less-desirable, safer alternatives. Bucks simply don’t get old by being brave. The same applies to water. Ironically, deer prefer stagnant puddle and small pond water to fresher options. Luckily, when these water sources don’t exist where hunters can capitalize on them, they can easily be created. All that’s required is cutting a large plastic drum to two feet high and burying it to the rim in a strategic low spot. If it doesn’t collect adequate runoff, water can periodically be brought in from a natural source. Where legal, adding deer minerals further increases its appeal. Just that quickly, a hunter can create water in the desert. With food and water sources targeted, the next element in the formula is seeing the buck you want to harvest. 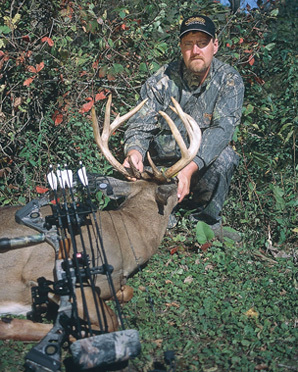 Early season success is all about nailing a buck’s route between bedding and food. Unlike during the rut, bucks aren’t covering much ground. If you aren’t keyed into his patterns the odds of success plummet. Observations and infrared cameras performing surveillance on selected foods and water sources are tremendous aids. When employing either, there are three goals. Obviously, the first is to make sure a shooter is present. Next, pinpointing his trail is key. All too often, one close call is all a hunter can hope for. Blowing it by guessing and setting up on a trail upwind of the buck’s entrance route almost always equals failure. The final goal of seeing the buck involves collecting his fingerprint. When a shooter is spotted, return the next day and find his track. Upon locating its hoofprint, measure the length, width and, if present, the distance between dewclaws. By taking it further, noting any identifiable features, such as rounded tips of the hoof, cracks or chips and anything else out of the ordinary, there’s enough detail to identify his track anywhere it’s left. In areas not conducive to collecting tracks, track catchers are easy to create. Armed with a garden rake, clear a three-foot section along a deer trail. When combined with his fingerprint, doing this can be used to literally track a buck in any location. Track catchers can effectively remove the mystery of whether Mr. Big is currently utilizing selected food and water sources, as well as his preferred travel routes. The importance of that in the formula for early season success can’t be overstated. Staying undetected and getting within bow range is what brings the formula to fruition. This begins with preseason reconnaissance. Gathering information on a buck is important. However, once enough has been gathered to peg him, it’s important to back off. Keeping reconnaissance activities undetected should always be a top priority. The same low-impact approach applies to hunting strategies. A balance must be struck between getting within bow range and staying undetected. So long as the buck doesn’t bust the hunter, the battle continues. Once busted, the war is almost always over. Because of that, I take an outside-in approach by focusing my hunting on the fringes of a buck’s core area and only moving in when necessary. Even when focusing on the outside, one should only hunt stands that offer the best access and lowest odds of disturbing the buck. Obviously, that includes only hunting stands with the right wind. Because of the low impact they typically provide, sitting stands on food sources qualifies as a productive way of hunting from the outside. Bucks commonly remain in their daylight feeding patterns for the first week of season, making them susceptible to this placement. 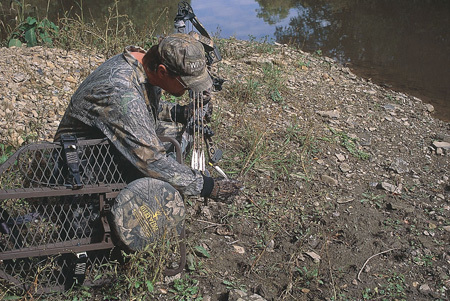 However, hunting food source stands means the hunter better be prepared to be pinned in the stand after dark. Crawling down before a sea of eyes will effectively blow the formula, even if Mr. Big isn’t amongst them. For the formula to work, the hunter has to wait until it’s safe to leave. Stands placed just off of the food source, back in the woods where the trail splits or is intersected by a crossing trail, is another good choice. Being 20 to 50 yards back in is often enough to catch bucks during the last few minutes of legal hours. The price is that the hunter loses the possibility of selecting the wrong trail, but still having a monarch feed its way into range. As the season progresses and daylight sightings drop, one needs to get more aggressive by moving in on the bedding area. The goal is to get as close to the bedding area as possible, without alerting the buck to your activities. 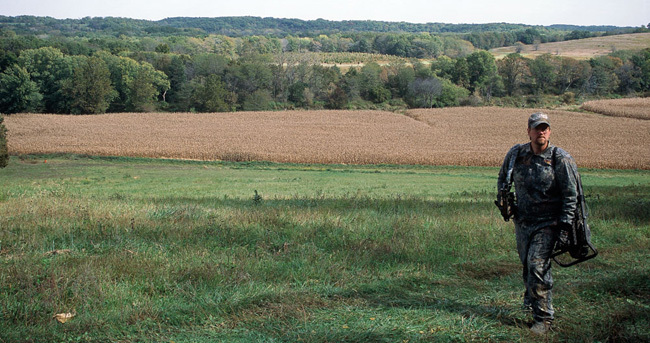 Though that distance varies depending on many factors, including the bedded buck’s field of view and noise made entering the stand, setting up within 200 yards is often possible. By employing that two-step approach, always keying on remaining undetected, I was able to harvest Elbow, as well as successfully put another hunter on Boonie. Until they are spooked, food preferences change or the rut cycle switches gear, early season bucks typically cling to the same patterns. Hunting from the outside in is almost always the most effective approach. Consistently scoring early on bucks requires patterning them. The more bucks you pattern the better your odds. Doing that requires a low-impact approach and an investment of time. Each year I rely on the formula to fill my Wisconsin tag before moving on to other states. Years of putting it to work have proven that the amount of preseason work I invest is a key element in the formula. Three of the past four years I’ve tagged out before October. This past season I didn’t put in the work and, not surprisingly, it took until late October to fill my Wisconsin buck tag. Simply put, the formula must employ all three elements to work. You can bet that I won’t make the mistake of slighting one again. For a comprehensive guide to cutting-edge stand-hunting methods, check out Steve Bartylla’s book. A full color, personally autographed copy of Advanced Stand Hunting Strategies can be purchased by sending a check or money order for $22.50, tax and shipping included, to: Steve Bartylla, 909 N. Chestnut Ave., Marshfield, WI 54449. Be sure to include your name and the shipping address.